PHP is a widely used open-source general-purpose scripting language to develop any types of static website to complex ecommerce website and other applications and can be embedded into HTML. Most of the largest and secure websites are running with PHP language. It is the core language of other platform like Zend, Codelgniter , Yii and more. We have been working in PHP for the last 12+ years and have gained expertise on various PHP application development frameworks and PHP services. Open source, free of cost. No licenses to purchase. 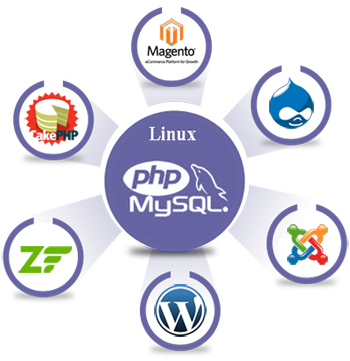 PHP can integrate flawlessy with many databases like MySQL, MSSQL, Oracle OC18, IBM DB2 and a few more. MaitKon has proven its grip on PHP’s core skills by developing the amazing websites, portals, applications which carry forward the essence of perfection. We render the fully-featured set of services to take your PHP-powered product online. Developing them from scratch, we make sure that it remains highly-specific to your exclusive needs. Cross-technology migrations from ASP.Net, ColdFusion and Java remain smooth, so that you can enjoy the simplicity as before. We also provide the database porting services and migration from PHP to JS, ASP.net, Java, WordPress, Joomla!, Node.js. By rigorously analyzing your business and the end-user expectations, we finalize the best features and thereby, bring them to life. Our enterprise-class e-commerce development services are highly-efficient and cost-convenient, optimal and feasible. Pixel-perfect design, rendering beautifully on all browsers and devices while being backed up by powerfully functional code, are implemented in the responsive websites so that you can enjoy the highest efficiency of PHP. Our specialists are developing diverse websites, web apps and portals for multiple industries for decades. Hence, our consultation can do magic to your online endeavours. From development to enhancements, our team can consult you for the best in all. To support the further development of your existing PHP product, MaitKon have amazing taskforce ready to work. We will go through the existing web app or website infrastructure to ensure that newer deployments don’t clash with the old implementations. With keen eyes, looking for the code faults, buggy snippets, wrong implementations and solutions not adhering to the quality standards, DOTS can help you optimize the websites and web applications by consulting right for the quality-elevation. To load-optimize your corporate websites, e-commerce websites, customized web apps, enterprise portals and other PHP products, our team has mastered the PHP source code optimization skills. Robust, secure and highly user-friendly deployment of payment gateways is easy with MaitKon’ services. We can customize the payment experiences for your buyers while keeping the process look trustworthy and simple. From fully-empowered CMSs (Content Management Systems) to customized Add-ons, CMS-based websites and portal functionality enhancement services – MaitKon can serve you with the unmatched services in all your technical requirements. CodeIgniter – Perceived as one of the most flexible and powerful PHP frameworks ever, MaitKon’s team of expert PHP developers use the power of CodeIgniter to build great looking content sites and small-to-medium web applications for our clients worldwide. CakePHP – MaitKon Solutions’ expert team of PHP development professional create brilliant applications that require PHP 4 compatibility using CakePHP. Suspected to be the toughest PHP framework ever, it comes across as a cakewalk for our exceptional developers. Zend – MaitKon Solutions has a dedicated team of Zend certified developers who are proficient in creating large scale enterprise level applications using Zend framework which suite the diverse needs of our global clients. Kohana – Our skilled developers use the lightweight and easy to use framework Kohana to build small-to-medium web applications and custom content management systems as per the specific needs of our various customers. Yii – Our exceptionally brilliant team of PHP development professionals use Yii, the highly modular, high performance PHP framework to rapidly develop web applications that meet our customer’s business needs adequately. Laravel – MaitKon’s team of skilled PHP development professionals use Laravel, the elegant PHP framework for web artisans. We create premium add-ons and extensions for the Laravel framework. Our PHP developers are qualified, skilled and trained and each team is supervised by a Senior Developer and follows a meticulous approach to ensure great results.